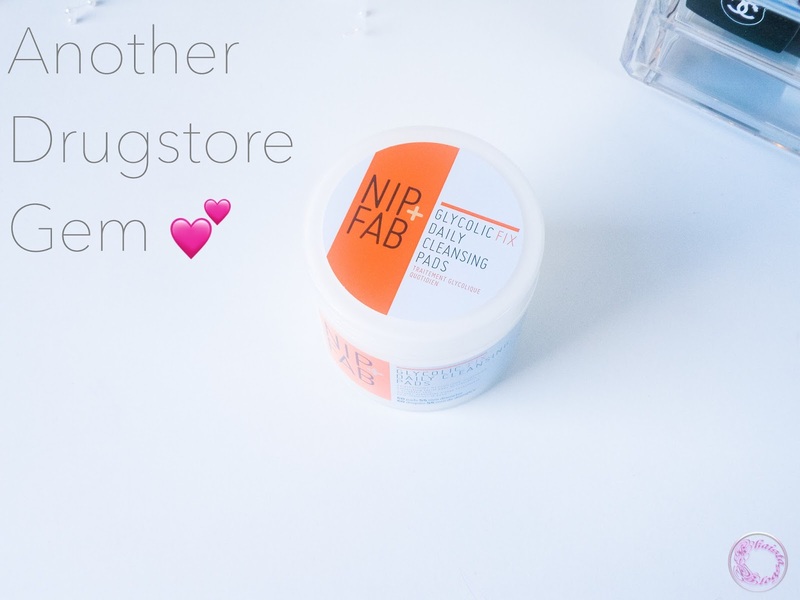 Nip+Fab glycolic fix daily cleansing pads are new addition this winter in my daily skincare routine after loving Avene cleanance glycolic acid based mask for an year now. 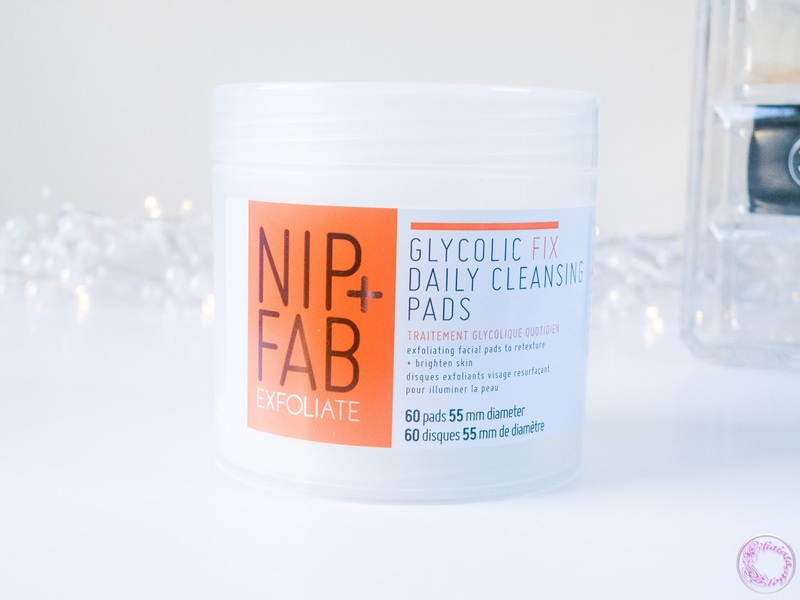 These pads come in a big plastic tub, which contains 60 cotton pads soaked in glycolic acid with other ingredients like hyaluronic acid to moisturise and blue daisy to soothes and calms skin. Individual cotton pad is quite thin. One side of pad has soft texture for exfoliation and other side is smooth which moisturises skin. When I opened the tub, I was expecting very pungent smell but it has very nice light citrus fragrance. It is suitable for all skin type and it is gentle enough to use twice a day. I don’t use it twice a day though. I use it after cleansing only at night time. But that is my preference because my skin is usually sensitive in winters and I don’t want to over-exfoliate. I struggle with some texture on my skin in winter. Some area on my face gets dry and sensitive while t-zone remains oily. This leads to blocked pores, uneven tone and patchy skin. This year I decided to take control of my skin before any problem occur. 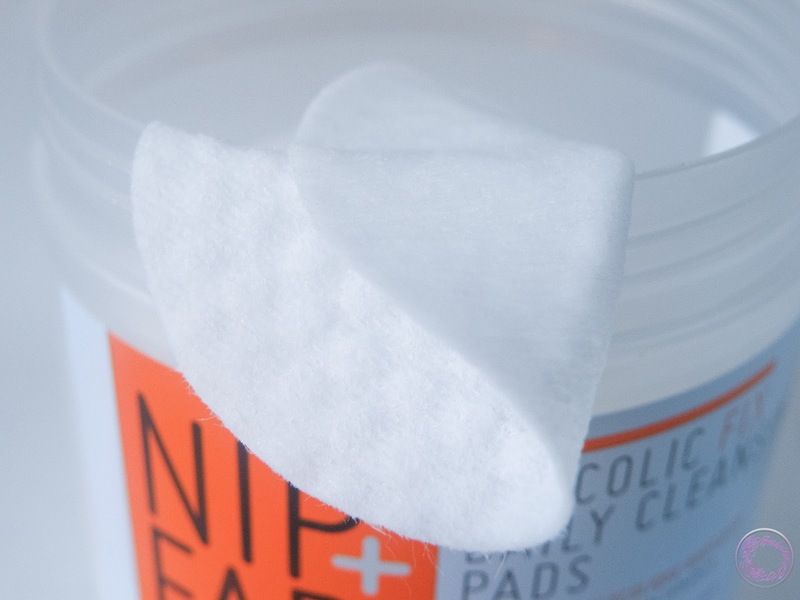 Therefore I decided to start using Nip+Fab skin fix pads. I bought it after reading mostly positive reviews but I thought it to be very gimmicky product. It turned out be very effective product. It is very easy to use with convenient packaging. Just swipe one cotton pad all over face and neck following by good moisturiser. After using it every night for almost two weeks, I noticed more improved skin. I didn’t feel the need to physically exfoliate my skin in last two weeks and all the bumps underneath skin are almost gone. With regular use, it fades post blemish marks but don’t expect it to happen overnight. It contains only 5% glycolic acid which is not of clinical strength. It is not solution for deep cleansing due to week strength of glycolic acid but is sufficient to get rid of daily dead cells buildup for youthful glow. After first use I got few bumps on my jaw line but then after two days they were gone. Since then my skin is spot free. Glycolic acid penetrates a little deeper into skin to cleanse and remove any grime/dirt stuck deep in tissues. I also noticed that I need less moisturise then usual and skin feels moisturise for longer. I will recommend it if you are facing any dullness and grey cast especially around mouth. It smooths out skin and improves pigmentation or any discolouration for healthy complexion and more fresh looking skin. A word of caution though. Along all positive things about glycolic fix cleansing pads I stated, I will must add that it may your make skin sensitive. If you have dry skin then must do a patch test before using Nip+Fab pads on face. If you experience severe breakout or sensitivity, any rash, stop using it immediately and consult your doctor. I am positive that there will be no adverse side effects with only 5% glycolic acid strength but be more careful. Always wear SPF to protect skin from burning and potential environmental factor to trigger any sensitivity. Do not use on a broken skin. It is available at Boots for £6.49 at the moment but original price is £12.99. Disclaimer: The review here is reflecting my thoughts only based on my experience. I always try to give my best opinion on every product I use. However, every product reacts differently on different skin type. I cannot guarantee that the product will work the same for you. These look so handy, I really need to do something more than just using cleansing wipes - sound like they'd be a great way to ease myself in! I love them for the convenience really. No hard work to get clean skin. Love it. Sounds like a great product and it's always good if you can get a cleanser that will cleanse And moisturise! Especially in winter! I will not consider it as a cleanser. but these pads do remove any residue of makeup. Love the sound of these as a slightly gentler way of exfoliating every day. Maybe I will get some as they are currently on offer in Boots - thanks for the heads up! They are great for this purpose :). I hope you find then suitable for your skin. I didn't experience any peeling with this products. Because it has moisturising properties as well. These sound really nice. I also have dry skin in the winter but it might be worth trying them while they're on offer! This looks so good! And i love the idea of pre soaked pads for Cleansing because i am so lazy when it comes to skin care. I will not consider it as a cleansing pads. It remove dead skin but must be used after cleansing. Never heard about the Clearsil pads. I am now interested to find out these as well. Thanks for mentioning. It looks so easy and convenient to use. Winters sometimes make me lazy for skin care regimen. Will be perfect for me. Definitely will get one. Great review.